With summer fast approaching, people are beginning to get prepared for backyard barbecues and trying to look killer in a bathing suit. So while we do understand that candies and confections make great edibles, not everyone wants to mow down on brownies right before beach season. But what if you want to be healthy and get stoned at the same time? 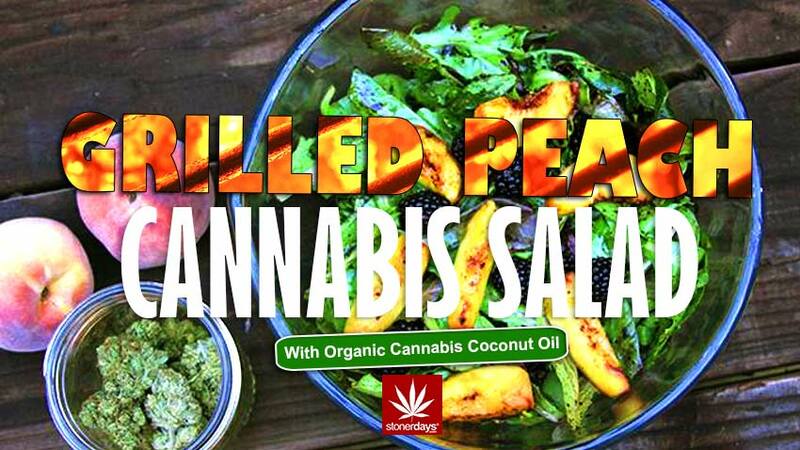 Easy enough with this simple recipe for grilled peach cannabis salad. This dish will be perfect for a get together with friends or something to make and store for lunches throughout the week. The recipe comes from Roxanne Dennant at Fruit Slabs, a vegan fruit-leather that’s made for healthy people on the go. The salad, while spicy, remains sweet with the taste of summer. This recipe calls for Fruit Slabs but if you don’t have access to these treats, you can substitute them for a cannabis infused olive oil to give your salad it’s heavy THC dose. Even better if you can get the Fruit Slabs as well as the infused olive oil to give the salad an amazing kick! Heat up your grill on low/medium heat and cut your peach in half. Coat the fruit with the cannabis coconut oil that you have and sprinkle cinnamon over the halves. Put a piece of tinfoil on the grill and once it is warm enough, place the peaches on for about five minutes. They should be warm but not too hot. If they get too hot, they will turn to mush so be careful to keep an eye on them. While the peaches are grilling, you can quickly gather the ingredients for the balsamic vinaigrette. Put all of the greens in a large bowl and top it with the blackberries. Once the peaches are off of the grill, let them sit for three minutes to cool down and then cut the halves in to smaller pieces and place them on top of the salad. If you have access to the OG Mango Fruit Slab, you can put the pieces on top at this point. If you have opted to use cannabis olive oil, drizzle some over the top of the salad, toss, and serve! This entry was posted in Featured, Stoner Cookbook and tagged peach, salad, stoner cookbook.